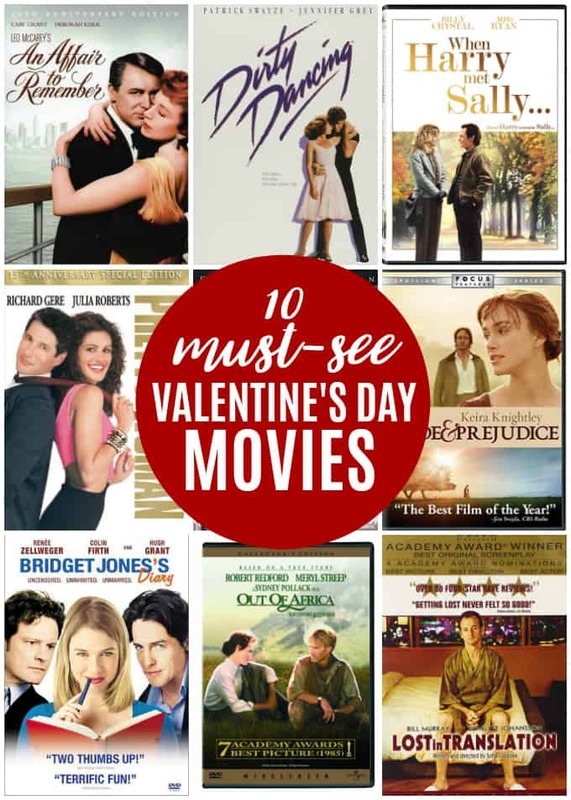 Whether you’re in love or recovering from a lost love, a good V-day movie can make your day a little bit sweeter, with or without the chocolate. ‘Without the chocolate’ isn’t really an option but if you’re not a fan of the sweet, creamy goodness that is chocolate, you can still cozy up with your favourite person and enjoy a Valentine’s Day movie. Some will make you laugh; others will make you cry. Whatever happens, you’ll be glad of the time spent in the end. The first time you see this movie, your heart will ache at the end. Cary Grant and Deborah Kerr are sublime and the movie is listed as one of AFI’s most romantic movies of all time for a reason. The two meet on an a ship, and though both are involved with other people, fall in love and decide to meet in six months at the top of the Empire State Building. Will they? Won’t they? Find out for yourself. The music alone is great in this movie, but watching ‘Baby’ and Johnny fall in love is better. Who knew that the Catskills was the place to be in the early sixties, a time of change in the politics of the nation, and in the hearts of a young couple. Sometimes life hands you the chance to spend a day devoted to love with one or more of the important people in your life. No reason to forego the romance though! Beauty and the Beast (2017 live action) is a perfect addition to your heart filled day. It has drama and action and just a little romance. Something for everyone. For Downton Abbey fans, ‘Matthew’ (Dan Stevens) playing the beast is a surprisingly good fit. Romantic comedies can sometimes be epically cheesy and if that’s your thing, be my guest! If you like more comedy than romance in your rom-com, check out this flick. All’s well that ends well, as to be expected, but the trip is worth the effort. Particularly the deli scene! You know this classic had to be part of the list. It’s the quintessential rags to riches, Cinderella story come to life on the streets of Beverly Hills. However you feel about the movie, there are moments in it that make it the classic that it is today. If nothing else, Julia’s laugh will make your day. When your love interest is none other than Mr. Darcy (Colin Firth), there’s really nothing else to but put your best foot forward, right? Bridget puts a left foot in, backwards and sideways in this funny romance, and you’ll enjoy it from beginning to end. Just don’t count your alcohol units as you watch. There have been so many versions of this movie, including the 1995 BBC episodic version with Colin Firth (who can forget the wet shirt lake scene? ), how to choose the favourite? Easy. Two words: Matthew MacFadyen. A virtual unknown before this film, he IS Darcy. Give it a try! This 1994 flick is nine kinds of enjoyable: there are laughs, tears, and some great actors. If you’ve ever been unlucky in love, this is a movie that you might be able to relate to. After all, always being the best man and never the groom can be tiresome as you will see, but it’s entertaining to watch. “I’m with you because I choose to be with you. I don’t want to live someone else’s idea of how to live. Don’t ask me to do that.” Love isn’t always perfect. It can even be messy and difficult but when it’s right… it’s right. And Robert Redford, in his prime, with Meryl Streep in one of her best roles ever, it’s beautiful to watch. The movie is exquisitely shot and carries you away with it. We don’t always choose who we end up loving, and even if it is only for a little while and not forever, it can be everything. That’s Lost in Translation. The unlikely pairing of Scarlett Johansson and Bill Murray doesn’t scream ‘love’ when you see it on paper, but on screen, they are delightful. Two American strangers. A hotel in Tokyo. One young and beautiful. One not so young or beautiful. But it works: the movie is a masterpiece of the understated and unsaid. Did we miss anything? I don’t think so but let us know if we did or which one of these is your favourite Valentine’s Day flick. These are some really great ones! I also love the cheesy romantic comedies like Failure to Launch, 2 Weeks Notice, the Proposal, etc. The original Out of Africa with Humphrey Bogart and Katharine Hepburn would be a better choice, did not know that there was a remake of that classic.